John Park – The Funny Waiter Show serves up laugh after laugh with a unique show guaranteed to be like nothing you’ve ever seen before. See a spine-tingling plate spinning finale (nine at once! ), marshmallows as airborne appetizers, an epic water drinking duel, bottle juggling, and the hilarious “chicken or beef” routine. John has appeared on HBO’s award-winning comedy “The Larry Sanders Show.” He’s wowed audiences in the Las Vegas Show “Splash” at the Riviera Hotel and Casino (voted Vegas show of the year). He’s the only act in the world to have opened up for both Donny and Marie and the Grateful Dead. His original approach to comedy has won him praise all over the world and made him a favorite with corporate clients such as Ford, Xerox, and IBM. The Hoax Waiter is walkaround entertainment appropriate for cocktails or dinner. As the name suggests, the entertainer poses as a real waiter dressed similarly to the rest of the waitstaff. The banquet manager and waiters are informed ahead of time that there will be an impostor among them. The hoax waiter starts off slowly. At first people will think he is a real waiter. But as the hoax waiter starts to exhibit odd behaviour people will start to scratch their heads and wonder. 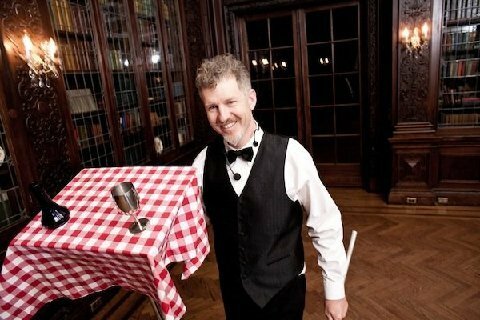 The hoax waiter will top up peoples water glasses with just a single drop of water, rearrange their fork and knife for no reason, offer the diners odd food items such as mini marshmallows, gummi worms, or other out of place things. In carrying out his duties the hoax waiter may walk around with far too many things in his hands and will often drop things as well. He’s even been known to carry around a wine bottle for his personal use only. Slowly but surely everyone will be in on the joke, and for those that are still unsure, they only have to witness the hoax waiter’s last routine. He goes around with a tray of four empty styrfoam cups tied with invisble fishing line to a tray. Offering coffee to a lucky table, he manages to upset the tray and the cups tumble off, towards the nearest diner. But of course they are empty and only fall a few inches before the fishing line arrests their drop. Very funny indeed, and the hoax waiter is off to another lucky table to do it all over again. How long does the Hoax Waiter Routine last? Is it possible anyone will be offended? It’s possible. Some guests towards the beginning of the routine maybe unhappy with the odd service. But by the end of the routine, most guests see that it was all a hoax and smile appreciatively. Does the Hoax Waiter insult guests, bump them, verbally berate them, spill liquids on them, eat off their plates, etc? No. While there are comedy waiters that specialize in this “Bad Waiter” style where the guests are abused, the hoax waiter’s style would be more aptly described as “subtle and odd”. The premise is that guests will slowly discover that the waiter is a hoax. What will the caterer think? Some caterers are horrified to learn that their client has engaged a hoax waiter. This of course is very funny, just not to the caterer. However, if this is a concern, an announcement can be made at the end of the evening clearly stating that the hoax waiter does not work for the caterer. Is the hoax waiter too subtle for some clients? Yes. Because the hoax waiter is posing as a real waiter and displays odd behaviour rather than outrageous behaviour some clients will find it too subtle and find that it builds too slowly. Other clients like that it builds slowly. Its fun for some guests to observe other guests that are not yet aware that it is all a hoax and watch their reactions. The end of the routine with falling styrofoam coffee cups is broad and by then everyone will be in on the joke.